Reader Question: Orange and Blue Wedding Inspiration, Please! 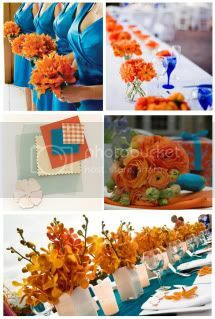 "I am getting married in August of 2012 and want a fresh color palette. I was thinking of a juicy orange and a jewel toned blue. My mom thinks I'm nuts! Can you help me find inspiration using these colors and help me to woo her to 'the dark side'? Thanks!"